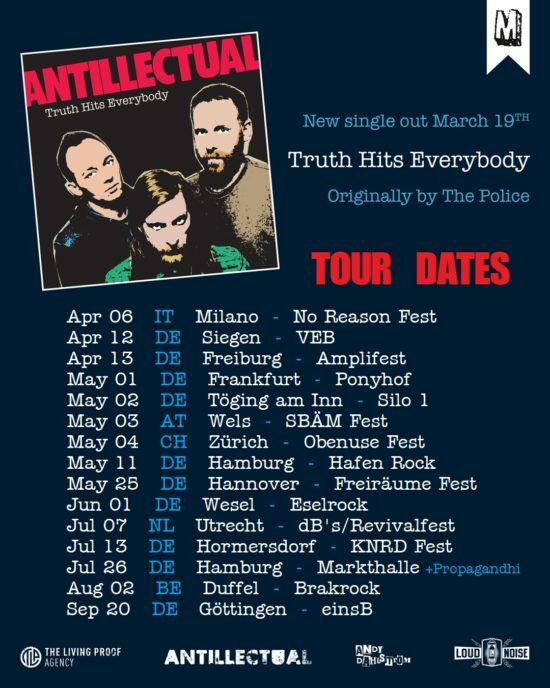 We’re very excited to present you our third single: TRUTH HITS EVERYBODY, a cover of The Police! In total we recorded 4 covers of “the roots of our roots”. Most of the bands we grew up on are still around or reunited, so we didn’t feel like covering those. It was much more interesting to go back one more generation and find early punk songs with a modern melodic vibe to them. Truth Hits Everybody was the first song that came to mind. It felt like something that would fit our style very well. We’ll release the covers sporadically, among our own singles. 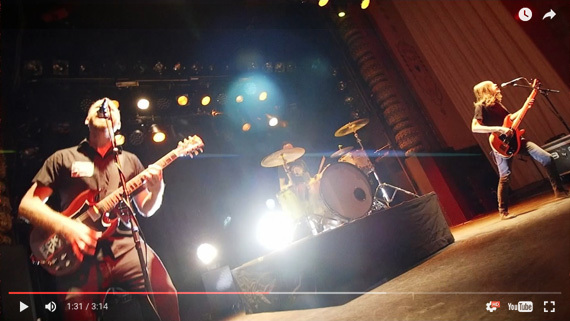 The video is shot in our hometown Nijmegen by Ruben Smulders. The Police’s debut album Outlandos d’Amour from 1978 inspired the artwork of the single, created by our friend Andy Dahlström (Satanic Surfers’ bass player). Drums and bass recorded by Emiel Thoonen; vocals, guitars and hammond recorded by Menno Bakker at Amsterdam Recording Company. Mixed by Menno Bakker at ARC, mastering by Carl Saff. The full video of Testimony live at Friends First Fest is online! For its 10th anniversary we played our album Testimony in its entirety (+ more recent bonus songs)! See yourself if you were at Friends First Fest #4! See for yourself what you missed if you weren’t! Which Testimony song from the live set do you like best? Shot at De Onderbroek during Antillectual’s Friends First Fest #4 on December 29, 2018. We are thankful and happy that we get to end every year with Friends First Fest. It’s an incredible way to end the year, and yesterday was no exception! Thanks to the massive group of people making De Onderbroek packed and sweaty, the way we like to see it! Sorry to the people that got turned down at the door for the venue being too full already. Next chance next year! Not unimportant, together with Minor Operation Donations we managed to raise over 1300 euro for Help Refugees! 2018 was a strange but good year for us! We started by closing the ENGAGE cycle and shooting and releasing a video series for Change the Standard. An enormous project which we couldn’t have done or wouldn’t have been as much fun without the help from so many friends. In 2018 we took a turn from our standard routing and started doing some things differently. Most noticeable we have stopped writing, recording and releasing albums. Instead we have started a song-by-song approach since June 2018. We were very anxious to release our first two singles (Heads You Win, Tails We Lose & The Invisible Hand Meets the Visible Fist) but were relieved when the response turned out overwhelming. We got to record the singles with Martin Beusker at Mailmen Studio, and something we will release in 2019 (to be continued!) with our sound tech Emiel and Menno Bakker at the Amsterdam Recording Company. We’ve shot videos with Younique Film, Ivana Smudja and many of our friends for our music videos of 2018. We played less shows in 2018 because of study related obligations, which will continue in the first half of 2019. But the shows that we did were great! The Loud & Rising Tour with Green Lizard and This Means War, festivals like Manchester Punk Fest, AntAttack, Uncle M Fest, Booze Cruise, Riez Open Air, The Sound of Revolution, Bierschinken Fest and an amazing weekend in Spain for Actitud Fest. We had incredible shows in Liège, Minden, Wermelskirchen, Kiel, Osnabrück, Hamburg and many other places. We got to say goodbye to Adhesive in our hometown/living room and met and shared the stage with all time heroes No Fun At All and Propagandhi multiple times. We also got to say goodbye to our loyal van for 10 years and hello to our new red menace! 2018, you’ve been good to us. And by that we mean “THANK YOU!” to all who checked us out, came to a show or helped us out otherwise in 2018! Another big thanks to our solid partners The Living Proof Agency, Loud Noise, Uncle M Music, Redfield Records. And last but definitely not least a big “THANKS!” our steady rock crew Roos and Emiel, and all others that joined us on the road! 30 October 2018 ~ Comments Off on New single The Invisible Hand Meets the Visible Fist out now! New single The Invisible Hand Meets the Visible Fist out now! Our new single is out today! 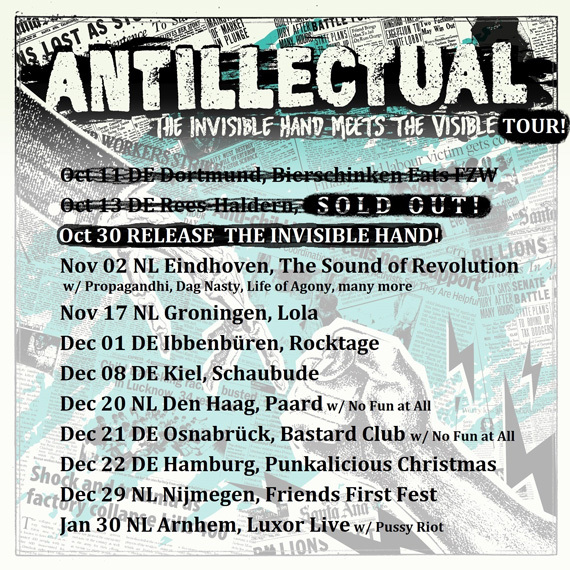 Finally we can present you the music and the accompanying video for The Invisible Hand Meets the Visible Fist! Merch with the artwork is now also up for regular sale via our site and available at our upcoming tour dates. This is our second single, so we officially have a “series” now! 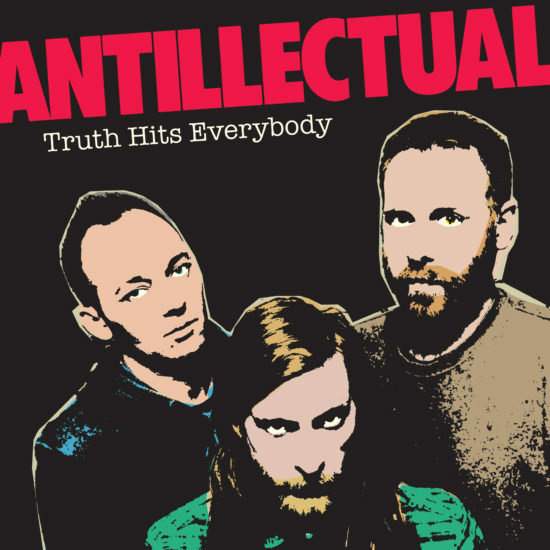 Check our new single on Spotify, Youtube, Bandcamp or your channel of choice via antillectual.com/theinvisiblehand. Listen, download, buy, spread and add it to your playlists! The Invisible Hand is an ode to conscious consumers in a capitalist world: a world dictating you to either produce commodities under sketchy circumstances or buy them. The song is recorded at Mailmen Studio and mastered by XPZ Sound, the video is created by Younique Film. 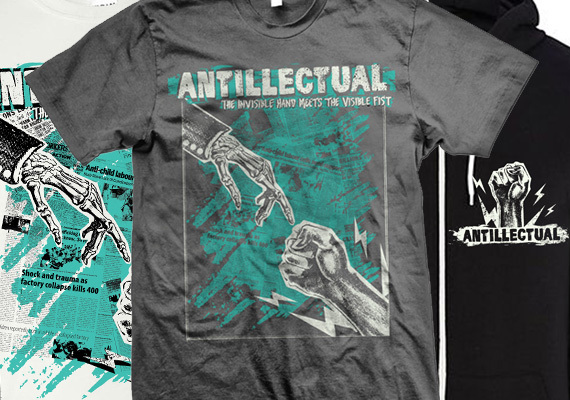 Order The Invisible Hand Meets the Visible Fist merch – organic, fair trade & sustainable – created by Daggers Design. With each order come stickers, posters and a download of the new single. Previous designs are still available, including package deals with our 10-year anniversary album Testimony. The end of 2018 is near, and that means Friends First Fest is coming up. We’re thrilled (and a little scared!) 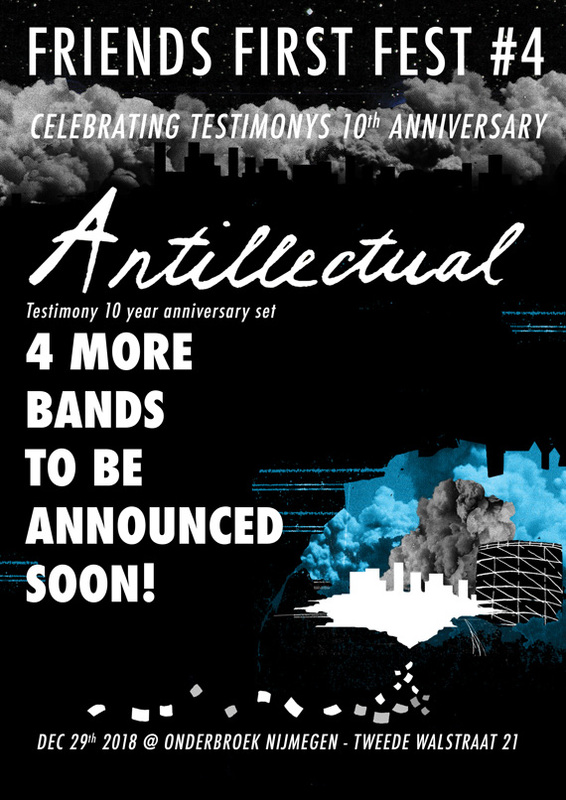 to announce that we will play a special TESTIMONY set, consisting of our 10 year anniversary album in its entirety, completed with more recent singles! We’ll be playing songs we never played live before from your favorite album*! Tickets are on sale now and come with a free Testimony download! We will announce other bands and details over the next weeks. *By us, from that year? 06 June 2018 ~ Comments Off on We’ve stopped making albums, but here’s fresh music! We’ve stopped making albums, but here’s fresh music! This might sound like mixed signals, but we want to take a new approach to releasing music. We will of course continue creating new music. But instead of bundling new songs for a new album, we will write, record and send them out to the world one by one. Today we’re pleased to bring you our first new single: Heads You Win, Tails We Lose! The single on Spotify, Amazon, iTunes and Deezer. Find lyrics, liner notes and the song via all other platforms here. What’s a new release without new merch? Dark Roast designed the Heads You Win, Tails We Lose artwork and FairTradeMerch printed beautiful shirts. With each shirt comes a download of our new single and a poster of the artwork. Order here! To celebrate our album Testimony’s 10 year anniversary you can now get Testimony (LP or CD) + a shirt for only 22 euro! Because of popular demand we also restocked on Engage shirts and tote bags! You’re not (very) active on social media but want to get updated when we play your area? Send your name and city to +31651708169 and we’ll keep you in the loop.